These are just the highlights of all of the activities at Chula Vista. For more information view the Chula Vista video or view the Chula Vista brochure. What is there to do at Chula Vista? Why should I stay at Chula Vista Resort? Chula Vista has one of the newest and most exciting indoor water parks in the Wisconsin Dells. There is plenty of fun too be had by everyone in the family. From 0 depth areas for the young ones all the way up to extreme rides for older children and adults. Just like the indoor water park, outside there is fun for the all ages but twice as much of it. After a long day at play, you can walk to any of 6 dining locations. The short answer is that there is something for everyone in the family. But to really understand why a stay at Chula Vista will be your best experience you have to experience it for yourself. We have provided some information below that will give a little taste of what we mean. What sets Chula Vista apart from other resorts is a total and complete vacation experience. The major parts of a vacation experience are your surroundings, departure from every day life, convenience and variety. Many resorts in the Dells may provide some of these but few, if any, will have them all. At Chula Vista you fell as though you are on vacation because of the beautiful and peaceful surroundings. 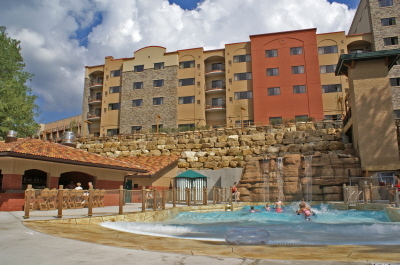 Located a couple miles North of Downtown Wisconsin Dells, the resort is carved out of a forest on the banks of the Wisconsin River. When you step outside, all you hear is the wind in the 100 foot pine trees and the sounds of the river. In the mornings you can take walk along the river and in the evening you can enjoy a sunset from your private balcony. From water parks, to dining to Broadway style musicals, you can do it all without setting foot outside. No matter how bad the weather is you can just put on your sandals and take a short walk to the 80,000 square foot Lost Rios indoor water park. While you are there you can sip a refreshment from the Tiki bar or grab a bite at Crash Landings snack bar. In the evening you can make your own meal in your full kitchen, head to the Market Fresh Buffet, Kaminski Brothers Chop House or choose from other dining options all just a short, indoor, walk away. For every person vacation is going to mean something a little different. A well balanced variaty of activities and amenities is what makes Chula Vista a great vacation for everyone in your group no matter if loud and lively is your preference or quite and serene. Choose from all levels of water activities, 6 restaurants, spa treatments, championship golf, hiking, dinner cruises, the party barge or maybe nothing at all. If you still need more check out the full list of amenities. Chula Vista is a South Western and Mayan styled theme resort. All of the resort is tastefully decorated and makes you feel thousands of miles from the Midwest. At the turn of every corner there is something a little different and unexpected. Somehow they have managed to tastefully combine elements of the Southwest, Mayan ruins, crashed airplanes, and North Woods wildlife. Certainly not your typical day at the office or day at home with the kids. Copyright © 2006 - 2019 DellsCondo.com, All Rights Reserved.